I'm writing down my goals here as a constant reminder for me and a target for me to achieve. I'm age 25 at the current time of writing (2013). The calculations are estimated and serves as a target for me to achieve. 4) what investment return should I get. If any of those cannot be met at any time, I should change my strategy or find means to achieve it. How do i achieve the 100k target? Current savings at $1300/month. 3 years saving add up to $46800 excluding bonus. Bonus in total will be $20400. Total achievable savings in 3 years is $67200. If i invest my current savings of 30k at a modest return of 8%p.a, total return for 3 years will be around $7200 (assuming no compounding effect). The calculations are based on my current job and my current savings which i've been able to achieve for the past 1 year. If take home pay is $2720, i can have monthly expenses of $1020. Investing with starting capital of 100K at 8% compounded returns, total capital at end of 5th year is $274,728. Assuming bonus of 2 months per year at net income of $2560, total bonus savings is $25600. Investing with starting capital of 300k at 8% compounded returns, total capital at end of 5th year is $594,887. Assuming bonus of 2 months per year at net income of $3040, total bonus savings is $30400. Investing with starting capital of 625k at 8% compounded returns, total capital at end of 4th year is $973,242. assuming bonus of 2 months per year at net income of $3600, total bonus is $28800. 1) to have a girl friend and to get married? YUP! omg after my engagement.wedding-solemnisation and honeymoon. n a life! I couldn't agree more. What about allowances to parents. School loan repayment. The calculations seem too simplistic to me. Yes to all your questions. In fact i'm furthering my studies now. The goals i set are guidelines for me. It shows me how much i need to save and invest during that period. If my expenses go up during that period, i will have to try and increase my income. Goals are something that can work towards to but at the same time must be flexible to change and adapt when circumstances don't favour. Marriage is a big expense. Hopefully i have enough extra savings to have a good wedding. Budgeting for it is the key. Property will need to buy sometime later. The key is to buy a house that is within my means. I will use not more than 35% of my salary for property. Car is not a necessity. I would only buy one if i can afford it comfortably. Parents falling sick. I am well prepared with medical insurance policies for my parents and myself. Not very expensive to pay annually. A portion will be paid by medisave. Hello brother, I am born in the year 1990, about 24 this year, SIM RMIT and was from banking and finance singapore polytechnic.Just ORD last year. An ordinary singaporean who loves discussing practical life issues with people my age group like you LOL! Sorry for my very long post, because I got a lot of things to ask you, you are my SHIFU! And have yet to eve start on my dream to accumulate the understandably difficult first barrier in climbing the wealth ladder to reach $1 million, but I believe that as we are better educated than our peers at having at least a poly diploma or a bachelors university local or overseas degree by this age, incomes that you have mentioned should be much higher. Frankly I think your income predictions at various stages in your career livelihood should be at least 20-30% higher than those you suggested. Furthermore, do you think it is realistic to consistently get 12 months basic pay+1 month AWS+1 MONTH mid year bonus+ 1 month christmas bonus=15 months pay every single year in majority of companies here? my point:It should have been $4000 gross,$3200 net by age 28, I know of NTU top business students securing banking jobs in CBD area earning $8000 by age 27,pretty young and cool sum.Then again it depends on sector,industry averages and permanent vs hire and fire basis. my point:revise your estimation upwards to $5000 gross and $4000 net.I think I am using the singapore statistics board to depict gross monthly wages for all singaporeans. My point:If by 38 years old if you cannot earn $6000 gross, your salary increment will begin to peak and plateau, eventually slow down by 40-45, so my target for you is $6000, very reasonable sum. I think generally speaking your objective is not far at all from attaining them because by adjusting your salary upwards, it takes into consideration the need for annual inflation, rising cost of goods and services CPI index, being the sandwiched middle class citizens. I believe that to make your life easier, pursuing higher education and furthering your studies should allow you to command a managerial position by default and support yourself and family. 1.BTW, how many kids you want to have- 2-4? Like most families regardless of race and religion? 2. Are you looking for a 4 room or 5 room HDB flat in city area(pinnacle duxton) or tampines/bishan/bedok area? 3.What about buying a car say cheap cheap one-toyota Altis at $133k plus COE? 4. What kind of lifestyle would you want to embrace-above average, fulfilling your families everyday necessities and some luxuries, or no luxuries expenditure at all? 5. what are your thoughts about achieving a $10,000 gross monthly salary plus bonus and everything? At what age do most people hit the very MAGICAL $10k? Now I am seeing you as a manager so your views are very well appreciated. 6.Another thing about making it in society is to perhaps consider opening a private banking account with UBS/UOB or some upper class foreign banks whose names I cannot pronounce,minimum sum to invest is disposable cash of $1 million USD(SGD$1,250,000), AFTER 42 years old, is that your next step in wealth creation,preservation and protection using complex and advanced financial instruments? 7. Do you plan to save $1 million SGD yourself or with your wife? Because if your wife is as capable as you at saving money and earning big bucks, your combined family savings would be $2 million by age 42.That is a pretty nice sum to have. 1. What is the definition of being young in every aspect-physically, mentally,socially and young at heart, I asked this because time factor is very important in deciding how fast you want to achieve financial freedom, get out of the rat race and live your dreams like you love to travel, why not do it younger? I have this question: what is your benchmark pay of a dream salary, not one that you could possible achieve with your working experience, education level, but rather your DREAM salary,then start working towards it, if you do not reach the moon, you land among the stars. scroll down to page 16 and 17 to take a look at min and max salaries and years of experience, I believe its achievable for you to become an engineering top manager by age 45-50 or director? I sincerely look forward to your reply as I am very interested in this topic of affordability, financial sustainability and income comparison in singapore context, something that should interest our youths of the 21st century. Thank you have a great day!!!! I do not own any blogs or websites so contact me at samuel_tan90@hotmail.com if you have furnished a response! Thanks for the calculation. I actually used a lower pay so that I don't look too ambitious. $4000 gross by age 28 is definitely achievable. I'll see how things work out then. I'll reply you by email. 17 years to achieve that is quite reasonable. There are many people who have been there done that and are now in their 40s. In fact I would think that most average middle income Singaporean would be able to achieve that too. hi, long time no post. i think the only difference between yours and my path is the 8% return which is very elusive for me. Yeah, its been a long time. You would've need to save much more if returns are lesser than 8%. I'll be focusing more on savings and increasing income too as its more predictable. All the best to you! I am 42 this year! HI SG young you are same age as me, I wonder occupation are you in? I'm currently working as an engineer. Just don't get too overly caught up and not enjoying the things you want to do in life which needs money because you get to be young only ONCE. Have a fine balance between spending, saving, investment etc..and reaching your target. Good luck! I have to admit I'm a person who likes to enjoy life. On normal days I live a simple life but I have an expensive hobby which is travelling. Well, lucky its not so expensive any more with budget airlines. Your goals are very achievable if u will be leading a single life, no car, no house, live with parents. Unless you have a high-paying job, realistically, you will have to scarifice quite a bit of your social in order to hit your targets. I am 30 and have about S$250,000 (1/3 in stocks). However, I can't say I am very happy. Ken's advice above is right, you are only young once, whilst it's godd to live within yr means, do not be consumed by it. Thanks for the advice. You have achieved quite a lot for your age. I think to achieve our targets, we can either save more or earn more. The first need to sacrifice social life and the second need to sacrifice time. I guess it is how we're going to balance it. You're not very happy because you sacrificed too much for it? I know when I start a family, everything will change. I can sacrifice myself but I don't think I'll let my wife or children sacrifice with me. I'm more incline to the thought of earning more while I still have time for my family. I just posted an interview of a Singaporean couple who have 5 children and they are very happy. Family to me is very important. Creating more income sources especially passive income is really important. I don't know how achievable is that and if it can be done. You have a good start and a good plan early in your life. Yes I agree owning a car is really expensive in Singapore. Public transport is good enough for me for now. I think the income we have makes a big difference in our savings also. Do you mind if i ask how long have you worked and what line are you doing? Chanced upon your blog, and im very much impressed by your goals. I sincerely believe you can do it! Am 27 this yr, working at a stat board. Currently furthering my studies. Started my Investing journey in 2011. Portfolio of around 50k, which consist of mostly Reits. Still far from all the shifus! Thanks for your encouragement. I have seen many others who have achieved much more than me so I guess it is possible indeed! Saving is a good habit that we should build up. It is something that we should do before we can start investing. I hope more young people will be inspired to save more money. You are very inspiring to me !!! I am 23 this year, I wish to have such a portfolio by age 25 as well. With proper financial planning, you'll be able to achieve many things. All the best to you!! Thanks for your encouragement. 200k is impressive. Did you go into business? I'm from an engineer background also. Most likely from next year onwards I'll be pursuing a different career in the finance industry. I guess from there then I can build up my network for more opportunities. I almost jumped into starting a business early this year but the plan was put on hold as after considering all the various factors, I feel its not the time yet. My passion is in finance and I will expose myself there. Looking forward to next year for a change. Its good to start young, as the key to compound interest saving is the length of time and not the amount invested. Though I'm a little sceptical on your budgeted expenses, its always good to set a goal and try your utmost best to stick to it. Just to share with you, I'm actually investing base on a concept from a good friend of mine which he term it as 'Defensive Investing' where he diversify his portfolios and group it as high, medium and low risk. The ratio is usually 20% high, 30% medium and 50% low. With this tactic we could actually cushion the impact of any financial crisis. As you just started your investment journey, you have yet to experience a financial meltdown where markets dropped 30-40%. So always be vigilant and plan for an exit strategy as well. Good luck on your journey and hope to see you at the top! Thanks for sharing the defensive strategy. What do you invest for high, medium and low respectively? 50% low I think is a little too much. Low risk means bonds and fixed deposits? There is another strategy which is similiar to this. Its called the permanent portfolio. You can check it out and google on it. Its a strategy that has a track record of stable returns even during crisis periods. My strategy is not to diversify intp different risk asset class. I practice asset allocation where I move money in and out of asset classes actively. I can be 80% invested into stocks now and later on 80% holding cash. There will always be red flag signs when the meltdown is near. When more and more dangers emerge, I'll move money gradually out of risky asset classes. One may ask how do we know there will be a meltdown soon? This has to be linked with the study of economics and I wont elaborate in detail here. Anyway, thanks for dropping by and inputing your valuable advices. I'm somehow skeptical on my budgeted expenses too. I will be able to achieve it for the next 3 years but after that it's hard to say. Hi, how do you invest to get 8 percent of return? 8 percent can be dividend yield return. Especially for high dividends stock, if you acquire at a low price, the dividends are quite attractive. 3) $3600/mth net income by age 38 (After deducting CPF) Gross income $4500 should be 6k. What degree are you studying now? What is the duration of the course and how much is it? The duration is 2 years and total cost was about 16k. I've already fully paid up all the fees. I am also age 25 at the time of writing but I have yet to graduate from university. Your income estimates are pretty low and I believe you would be able to reach your goals below 40 since you started much earlier. I am just starting to invest and your blog is very informative. Keep up the good work! Oh yes, I estimated the income lower so that I don't look too overly ambitious. I think it is possible for most average income earners to achieve 1 million before 50 years old. There should be some buffer in between in case something happens. Investing young has its benefits. Learning to invest at a young is an advantage. But I don't know about the "8% investment return on average compounded" part. Investing in index fund alone would have already achieved more than 8%. For the past 10 years, the STI etf returned on average 9% yearly. Of course this is only base on past results and may not reflect the future. But still, a number of people have achieved that and I think its quite possible if we have a little knowledge and the discipline to follow through. Another way I can think of is to invest for income. Buy stocks of good companies which pays 8% dividend. Continuing doing that and reinvest the dividends to let it compound further. Would like to mention that I'm a new reader and only came across your blog yesterday after it popped up on my feeds on facebook. So, your portfolio consists of 2 main components, ETF and dividend stocks? I guess it's fair enough but capital gains are prone to fluctuations to the cyclical nature of the markets and timing your exit might be a challenge if you want to ensure you realise that 8% target. I'm a (very) amateur investor/trader myself, though a few years older than you and having a degree, I am quite behind you in savings and had also lost some money in bad decisions. Will be following your blog, to have an idea what others near my age group. I think you're off to a great start anyways. And oh, I see that you're in the midst of writing an article on travel to Japan. Have been there 9~10 times to almost everywhere except Hokkaido and Okinawa for both work and pleasure at high-budget and shoestring-budget. I don't mind sharing some ideas. I do not have any ETFs in my portfolio at the moment. For dividend stocks, I buy those thwt are undervalued and give good dividends. I don't intend to sell unless the fundamentals of the company change drasticslly. If planning an exit, I will not exit all at once. Will only take partial profits. Then when it goes down more, I buy more. This will average the dividend yield at 7-8%. If the market crash, even better. I always have a warchest ready on standby to deploy in times of crisis. I stumbled upon your website and I am very impress with your plan to financial freedom. Even though you did not include expenses on marriage, housing, insurance and medical but due to your conservative in gross income estimation and exclusion of CPF, the above should be achievable. And in Singapore, most wife also have to work, so the above expenses is not solely bond by you. Hooray!!! Just wanna point out one view, I think you might not need to save up to $1 million to be financially free. If your investment is more than 8% per year and your expenses is only $1k a month which works out to be $12k a year, you basically only need to invest with $150k of capital to give your an annual income of $12k and you are financially free already. I have achieved it at age 32 with rental income (4 digit) from property and passive income (4 digit) from stock. I also started like you by saving a portion (30%) of my income. I have a wife too. hehe. Both of us are still working because we are planning to buy one more property for rental income. 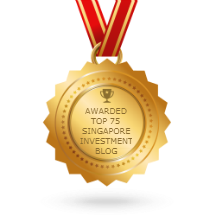 Still very impress with the details of investment knowledge you shared in your blog. I can share with you more if you interested and you can share it in here to help more people. Good luck in your investment journey. What an encoraging story you have. Thanks for sharing with me. I'm inspired to achieve financial freedom in my 30s too. You're right I don't need 1 Million to achieve financial freedom. The 1 Million is more for enjoyment if I really achieved that. Haha. Good to see a fellow 1989 baby being prudent and financially wise. Investors like us are visionaries in a way, able to see through into the distance while remaining balance along the way. I suggest that you can also look into playing better offence in terms of a better job and pay which will greatly enhance your financial position together with your current saving/investing habits. Thanks for your encouragement. I do believe in the importance of increasing income too. Studying for a degree, reading up to upgrade my skills and even creating more income streams are part of what im doing as well. Am glad we have similar goals. All the best to your financial journey as well. Well, some other people tell me my targets are too high. 5-6k at age 30 is impressive. I do know some others who've that kind of salary as well. A small side business is a good idea. I am an engineer, turning 30 this year. After paying off my university and other loans, I am left with nothing in my hands. I am married, wanna have babies soon. How do I start saving and investing then? I'm sure there are many others who face a similiar situation as you. I've heard of others who have their savings and even cpf wiped out because they got married, buy and house etc. I've not reached that stage of my life so I won't know how's the situation like. But I think we can still start all over again and start to save up. There will definitely be some sacrifices to be made if you want to save more money. Apart from reducing your expenses, try to look at ways how you can increase your income as well. It'll work out in both ways. Maybe I'll post your situation as a new blog post and see what other readers have to say and advice if they have similiar experiences. Good luck to your financial journey SGYI (: I am an '88 baby so we come from the same generation. I, too, would want to attain financial freedom. Before we hit our 30s, let's work ultra hard and save up capital for our investments. I am currently saving the same amount as you per month right now, but I somehow feel that savings would actually decrease as we get older because of family commitments in the future. Unless you have already decided to be single ur whole life? Nice to meet you my fellow 88 baby. Haha. I read some of your posts and I'm glad to see that you're having good goals and starting out on investments too. It's good to find a partner who's prudent in finances and also have the same goals which can strive towards to (imagine both husband and wife have 100k each, that is quite substantial for a couple investment fund. Hehe). It remains a dream for me. Haha. Hi, i am an engineer and currently earning 3+k per month. My basic expenses is about 10 to 20% of my salary. Cut out additional expenses make my annual saving to be about 20k yearly after including bonus and excluding cpf. I have expensive hobby like you" travelling". Hence i have a question: how do i further grow my savings when i am a very conservative investor that depends mostly on fixed income, corporate bonds, and saving accounts. Any suggestions? Thank you. Welcome to the savers club. To save 80-90% of your salary is quite impressive. When we invest, we have to make sure that our returns beat the inflation rate which is on average 3%. The only way to beat that rate is to invest in stocks which is more risky or invest in index funds such as the STI ETF. I've written some articles on index fund investing. You can refer to thd right side bar of my blog. Thanks for the suggestion, however after reading... STI ETF is still a mystery to me as to how this index fund works. Am i buying stocks of whole of STI and what are the risk in this ETF. If i were to buy this index, will i be locking a lot of cash in it.... as in a long run might decrease the value of my cash as inflation goes up. STI ETF is an exchange traded fund as what the name suggest. It is a fund that consist of 30 of the largest companies liated on the SGX. The fund tracks the movement of the STI and adjust according (with some tracking error). The risk is the index does goes up and down similiar to stocks. If you sell at a lower price than what you bought at, then there will be losses. After buying the STI ETF, you can sell it anytime immediately. Your cash won't be locked in it. This fund does give out dividends which is on average 3-4%. It does cover the rate of inflation. Hi any idea where and how to invest in s&p 500 etf? If you want to buy through the Singapore stock exchange, you can check out SPDR 10US$ and ishares s&p 500. Both can be bought directly from SGX using your brokerage account. Alternatively, you can invest in the vanguard s&p500 etf on the US stock exchange. Plus I transfer S$1000 to my parents in my country. After all, I can save very few amount monthly for myself. I wish you can fulfill your goals by each step you set. You can do it too. I see your expenses are quite managable. You can certainly look at increasing your income then you'll be able to save more if you keep at the same level of expenses. Wow 6k salart at the age of 28. That's quite a lot. Most of my peers aren't getting as much as you. Yup, increasing income is important. I'm focusing on that now. Investment is never predictable. It is for long term anyway so won't make us rich in a very short time. Do you mind if I ask what do you work as and how you got that salary at your age? You will reach your target of 1mil nonetheless, as you have grossly understated your earning powers ( and very importantly, you chose to lead a non-materialistic lifestyle). the clarity of your thoughts from the way you present your ideas in your articles, high EQ from your tactful replies, industriousness based on the number of articles posted and response replied, i believe your earning powers would at least doubles when you are in your early 30s. Thanks for the advice. Somehow 8% was my target back then when I first started out. A 4-5% return would be more conservative. You're reaching 28 soon. Is the goal still possible? Yes its still possible. Latest by June next year I will reach that target of 100K. Thanks for your posts. Could you share with us your experiences and perspective in investing in developing market in ASEAN. what kind of stock can be good pick? Myanmar is going to launch its first stock exchange in this year. What would be your advice in that kind of market where financial market is not very regulated. Should I aslo buy IPO from there? Currently there are a few listed companies trading OTC. So far, I've not really looked into investment in developing countries. I think the easier way is to look into established companies who are venturing into these developing countries. I would not buy any IPO from there as i do not know how their financial markets will work out. It is very speculative at the moment. Love how well-thought out your plan for your life is. I am 25 this year and currently planning to get married next year. Honest to say, many things to save up and plan for. Marriage, house, kids etc. But I am not very good with money. At times, I spent more than my limit and always can't wait for pay day. Would love that you can share more with me your good financial habits. Im of the same age as you. But my financial status is not as good as yours. Mind sharing your tips with me too? derricktay88@gmail.com THANKS IN ADVANCE ! The simple way is to increase income and reduce expenses then learn how to invest and grow our money plus generate passive income. Keep doing that and we'll reach financial freedom one day. I am working in IT line, age 32, female with one child, earning 10k since age 30. Expenses wise Per month is about 2k - parents allowance, insurance, flat payment etc. I have savings of 250k as of current. I am not sure what to invest but only put in fixed desposit. =) I have similar plan as you. I like to attain 1m at age 40. All the best to your goals too. I think its even more achievable for you as you have a high income and you don't have that high of expenses. I am glad to come across your post. I feel I am far from everyone with regards to saving because I used to spend alot when I was younger. And all my savings back then, though not alot, were wiped out when I got married, bought a new flat (renovations, furnitures etc) and got a baby. I am 35yo, earning 13K per month. I spend half my salary on several commitments (1K parent allowance, 1K childcare, 1K grocery and household, 1K personal shopping and food, 1K transport/car and about 2K insurance). I only have about 300k cash savings but my hdb 5room is fully paid for. If I continue with saving about 5K per month, do you think I can achieve 1mil by age 42? I have many insurance policy - Do you consider insurance as savings too? I feel so motivated to save more and spend less after reading your blog. If you save 5K a month, I'm sure you'll be much better off by the time you're 42. Do some investment wisely as well and you'll be able to hit 1 Million soon. I happened to stumble on your blog recently. Your blog is my inspiration. I am a single 30+ average income white collar working for about 9 years. I dislike my current job till I want to quit. I told myself to bite the bullet till next year before I quit. After I quit, I would want to take a year break to learn about investment and blogging. I would like to seek your kind advice whether i should quit and take a year break to learn about investment? A job is the most important in our quest for financial freedom. To say the truth, investment is just a part of it while earning income and saving money is the main part of it. If you have enough income to sustain you for one year, taking a break and rethinking what you really want to do in life may be good also. But, don't focus on learning investment only but also think about what you really want for your life? Finding a job which you like is important. At the age of 23, whereby I am still studying, I would like to know what is the most appropriate amount that should be set aside for STI as an investment? Apart from that, would it be recommended for me to select POSB Investor for my investment or is there any other suggestions that you have? P.S. I am still a beginner and does not have a clear direction in Investment. Hence, it would be nice if you can share some of your knowledge with me. You can contact me at tngzhicheng@gmail.com. Thank you in advance. When investing, always question your motive. Investment is for the long term and when you invest any money, be prepared that you'll not use it at least for the next 5-10 years. This is just a guide that i follow. I always invest money which I have and will not use in the short term. Yeap, i know that investment will be a long term. I'm a saver more than a spender but i don't want my saving to rot in the bank with 1% interest rate. I'm planning to take out some of it for a long term investment and probably i wont be touching it for the next 10 -15years. Is it ok to start at a base of 20k? Or should i save up more? And, I'm unsure about the difference of sales charge from the bank and hence i don't know where to start from. Yes 20K is a good amount to start with. Brokerages mostly have the same charges. Not much difference now. Thanks for reply, i will read up more! On the side note, do you think is it a good timing to buy Keppel Corp Ltd? Keppel corp is a big company. Buying at a low price and keeping for long term would be good. However, in the short term, i suspect prices will continue to drop. It'll take some time to recover. Should i go for POSB invest saver? You can definitely consider the POSB invest saver. In the meantime, you can read up more and learn how to invest in stocks. And also, saving up and focusing on your active income is important too. im of age 25 this year and i just started my first job, my pay range between 4k-5k a month.. i actually plan to save at least 2k every month and then use it for investment? do u have any tips on investing like what i can invest on? i would really want to achieve financial freedom before the age of 30. Please email me at ericssonlobiz@gmail.com i would love to communicate more with you via email. thanks. Saving 2k a month is a good start. Once you have about 10-20K, you can actually start building quite a good portfolio of stocks. Achieving financial freedom requires the building of passive income. Passive income can be created from many places such as dividends from stocks, rental from properties, royalties from intellectual property, income from business etc. You can email me at sgyounginvestment@gmail.com. $5000 can't really build a good stocks portfolio. You can start with index investing on the STI ETF. POSB has a plan called the invest saver where you can invest in the index fund for as low as $100 per month. Hi There, Well done. The hard truth about becoming a millionaire young is to live way below your means. Keep up your good work. your passive income is impressive. Let me give you my 2 cents having a good education is important but not essential. However having the mind to think differently and the courage to be different is necessary. Your fixed monthly commitment in life will continue to increase as you grow older. thus having a strong passive income stream during a young age might help u to grow your portfolio faster. You should target to save about 1.4 million by age 42 as you forgot to discount the yearly inflation. I have assume an inflation of about 2.4% discounted back to today dollar . Keep up the good work it can be done.. I have been thru your road before when i was young and have no regret. Wealth is not define by how big your house is but by the definition of when u decided to stop working how long could your passive income could last you for. Thanks for your advice and encouragement. What you said reaffirms me believe in wealth building. I hope i can achieve my goals as how you have achieved yours. The best way is to work backwards and see how much you can save monthly and annualy. Then you'll know whether its achievable to attain 1 Million. Time to do some calculations and you'll see how it all works out. I am impressed! I wish i started thinking like you when i was your age. Keep up the good work! Thank you for your encouragement :) I wish you all the best in your pursuits in life too! Interesting Blog. I have a question, if you have 10k now, what would be best thing to invest in. Thanks. It definitely answers my question. Do you reccomend unit trust. Unit trust is another investment option but do take note of the higher fees. If the fees are too high it doesn't make sense to invest in it anymore. What kind of investment are you target for ? hi, am 23 yo and have 110k cash and 1 gold rolex watch valued 16k. am saving 4k every month. am not sure what to do with my money. am aiming to save 40k-50k for 2017.
want to ask how you keep to your saving goals and how much have u saved till date. respect u as is not an easy feat. want to learn from u how to be better also. For my savings, i just auto transfer an amount to another bank account and never use it to spend. This is how i keep to my savings goals. If i can't achieve it, i increase my income so its easier to save. You're very inspiring and a role model! I'm keen on saving smartly just like you but am wondering where you make investment of 8% p.a. Is it high risk? Thank you for your kind words. Yes the first step is to save. Next is to invest. I invest mostly in stocks. 8% should be quite achievable once you get the hang of it. Take your time to learn and you'll be able to do it too. Hi, how many % of your savings are invested in your stocks? how many % cash u would suggest holding? would u mind if u can share how many % of your savings are in cash? May you share with us. Where to found 8% ROI investment? You can get 8% ROI from stocks. I'm 39 this year, I went through the same journey as you but of course I'm less ambitious and rather lazy in the earlier years. Having seen your breakdown, I compared to what I've achieved over the years, I must say your goals are definitely achievable, and you might be able to achieve more! I'm impressed by your clear thoughts and determination, I wish I could see what you've seen when I was in my twenties and I would have invested more in equities. I can see that you're very clear of what you want. On spending and marriage, after going through all those I really think that most of the expenses are not necessary and could be avoided. As a mother of 2 now, I find what's more important is the financial freedom and loving family rather than expensive wedding banquet, I wish you find a girl that could help you manage your financial, and I'm sure you will. Thank you for sharing your experience. Its a great encouragement. I'm actually in the midst of preparing to buy a flat as well as planning for marriage with my partner in the next few years. All the best to you too! Can you share your XIRR returns if you include your cash and bond component of your portfolio in the calculations? It doesn't include cash and bond portion.